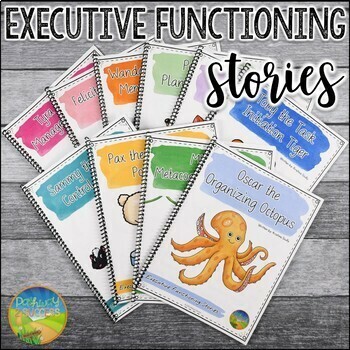 Use this complete set of executive functioning stories to teach kids the skills they need, including organization, planning, attention, flexibility, perseverance, planning, time management, and more. 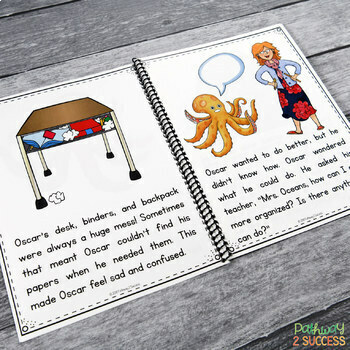 Kids will read along with each fun animal character while learning about executive functioning skills. Every story also includes an educator guide, story review worksheet, coloring page, role-playing activity to practice the skill, a contract, and more. Overall, these stories are a fun and interactive way to introduce, discuss, and practice critical executive functioning skills at any age. Executive functioning skills are the basis for planning, organizing, initiating, and following through will all tasks, assignments, and problems. We use these skills both inside and outside of school. Many students who forget assignments, are disorganized, can’t complete long-term assignments, have trouble focusing, and experience difficulty with change often have weak executive functioning skills. These are the students who need to be taught explicit skills in order to become successful in school and in life after school. Simply put, executive functioning skills are necessary life skills. 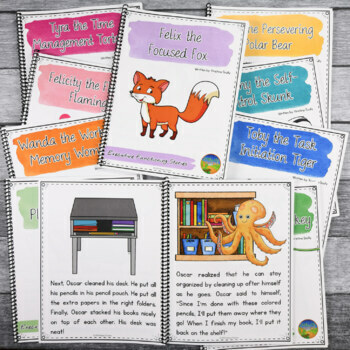 Each resource includes: a unique short story focused on an executive functioning skill, educator guide, story review, coloring page, skill response, role-play worksheet, skill contract, and skill poster. Note: This resource is a zip file because you will receive the educator guide and worksheets, the black and white story, and the color story. This allows you to print just the story the size you want with no hassle!